"MAKES MY LIFE SOOOO MUCH EASIER!" - Mix with water, it dissolves instantly. Use immediately to water your plants. It doesn't matter if you have sand, loam or clay soil; your plants will be the healthiest, most beautiful and flavorful as they can be. Because our Beneficial Microorganisms Ⓡ go to work immediately to condition your soil and feed your plants. DEPENDABLE AND SAFE - We're a family business dedicated to providing you with the best organic plant food for your garden and the planet. 100% safe for you, your children and pets. PLANTS LOVE IT! - Works great for all stages of plant growth, from seed to harvest it's like giving your plants an all you can eat buffet. Because every tablespoon is loaded with every essential element, micro nutrient and trace mineral your plants need to grow and thrive. Doesn't break down into salts like chemicals do. And it will NEVER burn your plants - Guaranteed! SAVE TIME AND MONEY: Skip the difficulty of making your own compost and compost tea which takes both time and skill. And there's no need to waste time testing your soil and then treating with multiple products. 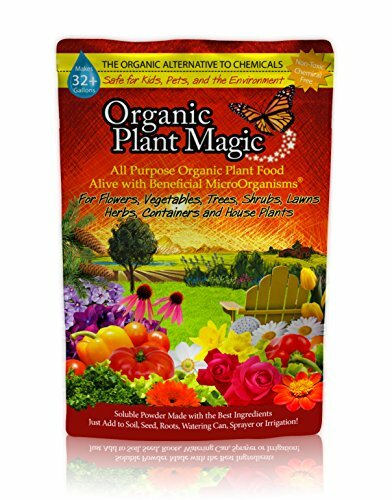 It works even if you are a beginner gardener, because our organic fertilizer works for every plant you own. Healthier plants also resist insects so you don't need harmful pesticides. Economical because one bag makes 32 gallons. 100% YOU'LL LOVE IT OR YOUR MONEY BACK GUARANTEE! We're so sure you (and your plants) will love our plant fertilizer. That is why we extend a 30-day, 100% money back guarantee and invite you to reach out to us with any questions or concerns!